The United States and its European allies have maintained a strong transatlantic relationship for more than half a century, even if Americans and Europeans have not always seen eye-to-eye on foreign policy issues (the Iraq War nearly a decade ago being a prominent example). Today, there are some notable similarities between public opinion in the U.S. and Europe, although there are significant differences as well, a new Pew Research Center survey reveals. And on both sides of the Atlantic, there are sharp ideological divisions within nations over key foreign policy issues. 1 Americans and Europeans are looking inward. Nearly six-in-ten Americans (57%) believe the U.S. should deal with its own problems and let other countries deal with their problems as best they can; just 37% think the U.S. should help other countries solve problems. On balance, Europeans are also focused on their own challenges, although half or more in Spain, Germany and Sweden want to help other nations. While this nation-first sentiment has seen little change in recent years in Europe, it has grown by 11 percentage points since 2010 in the U.S.
2 ISIS is seen as the top threat on both sides of the Atlantic. Eight-in-ten Americans say the Islamic militant group in Iraq and Syria is a major threat to the U.S., similar to the median of 76% across the 10 EU nations polled. Concern about ISIS is particularly high in Spain (93% say it is a major threat) and France (91%). Americans and Europeans may agree ISIS is a top threat, but they differ in how they rank other concerns. For example, while climate change is the second biggest concern in Europe, it is lower on the list in the U.S. Instead, Americans name cyberattacks as the second greatest threat. China’s emergence as a world power rates relatively low in both the U.S. and Europe, although Americans are more concerned than Europeans about Beijing’s growing power. 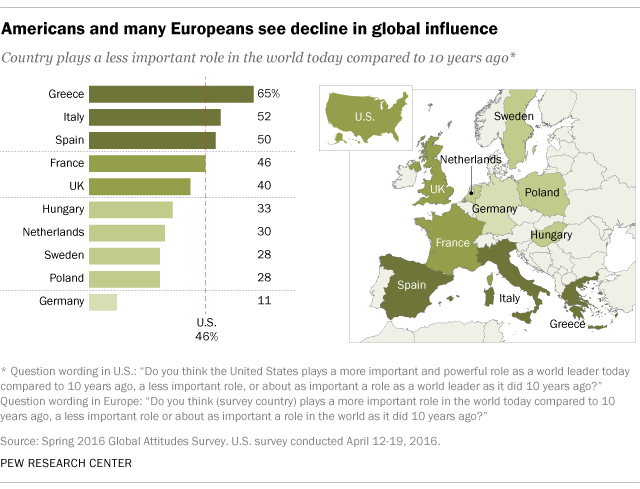 3Many Americans and Europeans believe their national influence is waning, although Germans believe their country’s influence is on the rise. A 46% plurality of Americans believe the U.S. is less important and powerful than it was 10 years ago – a share that has been at historic highs in recent years. Majorities or pluralities also say their country is less important in Greece, Italy, Spain and France. However, just 11% hold this view in Germany, which in many ways has taken a more prominent role in European political and economic affairs over the past decade. A 62% majority there says Germany is more important than a decade ago. 4 Americans are more wary of economic globalization. About half of Americans (49%) say U.S. involvement in the global economy is a bad thing because it lowers wages and costs jobs; only 44% think it is a good thing because it creates new markets and opportunities for growth. Europeans tend to embrace economic globalization, although Greece is a clear exception. Support for economic engagement tends to be higher in countries where people are less worried about the effects of global economic instability. The belief that economic engagement is a good thing is especially common in the Netherlands, Sweden, Germany and the UK – the only four nations surveyed where less than half of the public considers global economic instability a major threat. 5There are big ideological divides over foreign policy within the U.S. and European nations. For instance, Americans and most Europeans on the right of the political spectrum are more likely to say their country should focus on its own problems rather than helping other nations with their challenges. Meanwhile, in the U.S. and in most European countries, those on the left are more likely to say human rights should be a top priority in foreign policy. There are also significant ideological gaps on both sides of the Atlantic on issues such as climate change and foreign aid, with those on the left more concerned about climate change and more willing to provide assistance to help developing nations.